On April 23, like any other day at school, Rithik, a class 8 student, was busy taking notes off the board before the last bell went off. In the excitement of wanting to play cricket after school, he scraped his knee against a nail under the wooden bench. Little did he know that the little Dettol and a band aid he put on it was not enough for what was ahead of him. "When the wound changed color, I knew this was not normal." Soon the doctors confirmed that Rithik had Osteosarcoma of left distal tibia, an aggressive type of bone cancer. 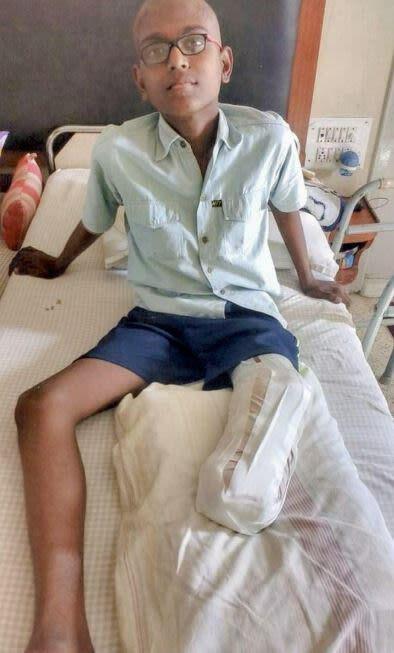 Despite best efforts, Rithik’s left leg was amputated to stop the cancer from spreading. Yet, today, this 13-year-old has a long fight ahead of him. Doctors suggest Rithik needs 6 cycles of aggressive chemotherapy sessions and 3 months of post-maintenance care. 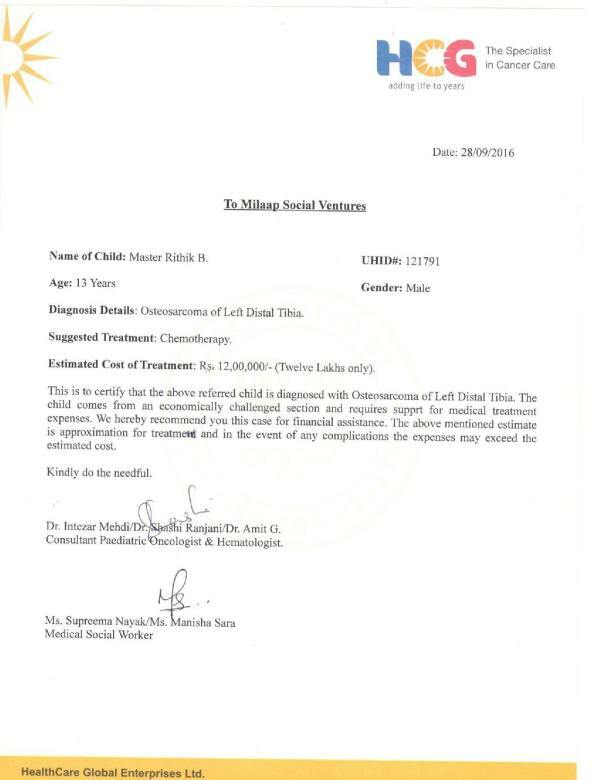 The cost of the treatment is around Rs 12 lakh. 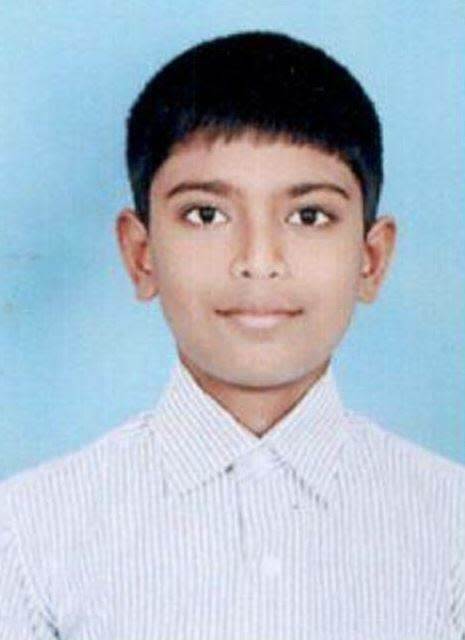 Rithik’s father works in a small agro-based organisation in a village in Tamil Nadu and earns Rs 9,900 every month. The amputation surgery cost them around 8 lakhs. With Rithik’s twin brother and elder sister to take care of, the family is left with nothing to make ends meet, let alone continue Rithik’s treatment expenses. Today, Rithik is getting treatment in HCG Hospital, Bangalore. He might have lost his leg but this young boy wants to fight and win this fight with cancer. "I know I cannot play any more but I still can study. Doctor Sir has been telling me about many sportsmen who got back on their feet after losing a leg. I want to be cured and never look back to these long nights in the hospital," he says. 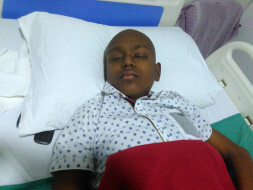 Rithik needs your support to get 6 cycles of chemotherapy sessions. The family is going through an arduous time. You can help them cope with the tragedy and provide them the support they need to lighten their load. Help Rithik get life-saving treatment. We spoke to Hemlata, Rithik’s mother. He has already gone through five chemotherapy sessions. The last and the final chemotherapy session began on 25th January which is expected to end only in the second week of February. After each cycle of chemotherapy Rithik suffers from a series of side effects like high fever, extreme throat pain, vomiting and fatigue. His mother is extremely saddened to see her child suffer like this. Please share Rithik’s story and help him fight this battle. We are still very far away from reaching the campaign target. We request all of you to share the campaign in your friends and family networks over Whatsapp, Facebook, Twitter. Spreading the word will go a long way in ensuring complete treatment for Rithik. Get well soon dear . Praying for him. He will be back to his normal life soon.